We proceed to model jointly signals and dependence so as to obtain sharper test statistics after eliminating, as much as possible, the impact of dependence. This impact is particularly obvious in the following illustrative example. The dataset ‘simerp’, which is provided in the ERP package, has been simulated using the same covariance structure as observed in the ‘erpcz’ dataset. A relationship with an arbitrary continuous covariate has been added by means of a simple regression model at each timepoint between 450ms and 550ms. 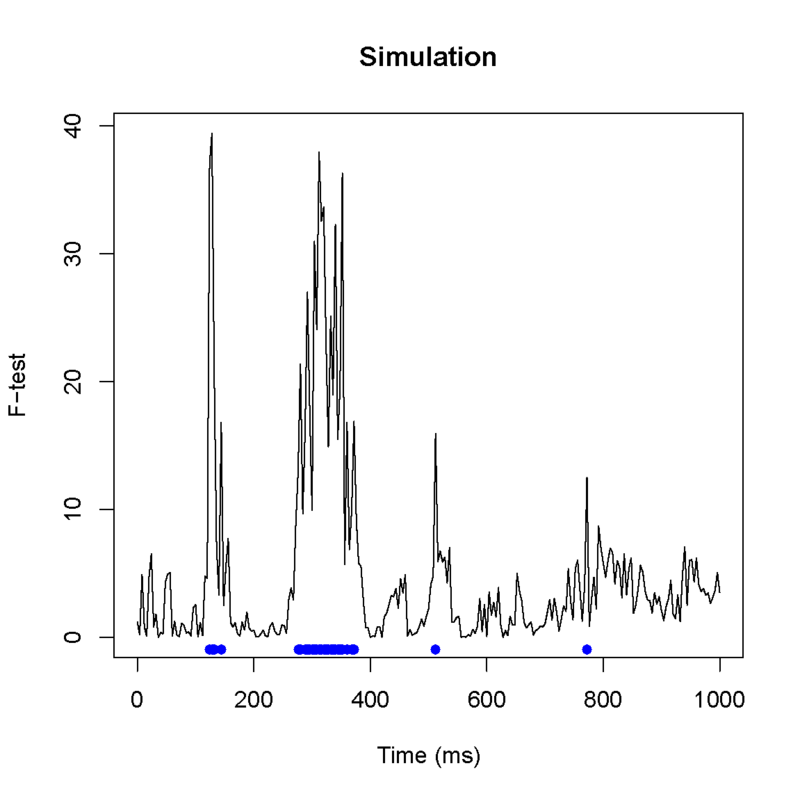 Outside of this peak interval, the ERPs are not correlated with the covariate. Therefore, it is expected that any multiple testing procedure finds a significant peak around 500ms. 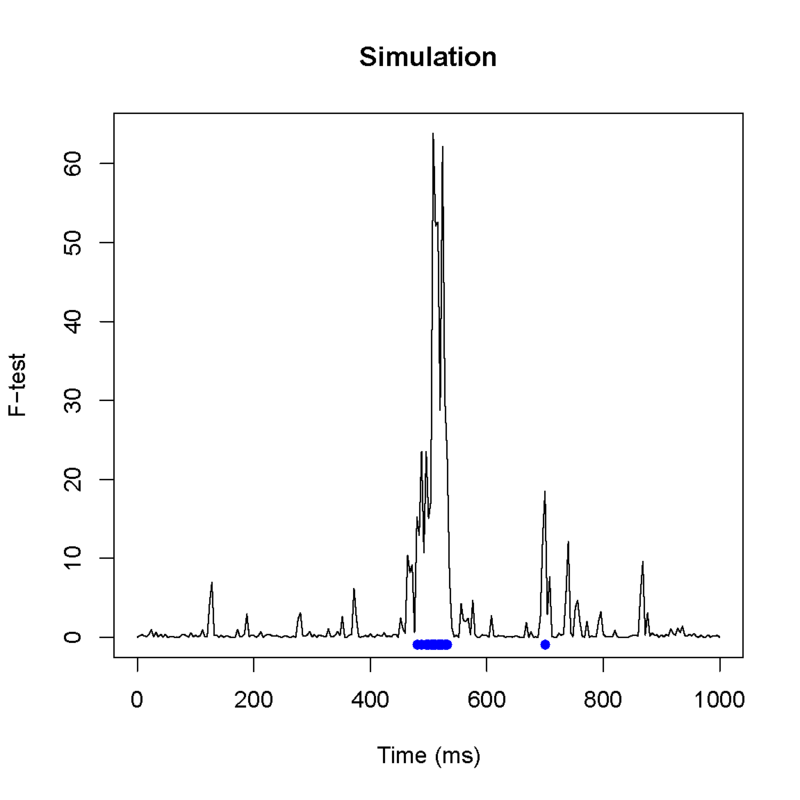 As revealed by the resulting plot below, the procedure clearly fails at finding the peak around 500ms. This suggests to handle dependence in the multiple testing procedure. As suggested in Friguet et al. (2009) and adapted to the ERP framework in Sheu et al. (2014), latent factors are introduced to capture linearly the time-dependence among residuals. Similar approaches with different estimating strategies can be found in Leek and Storey (2008), Sun et al. (2012) for multiple testing in high-dimensional settings. As in Friguet et al. (2009), the estimating algorithm is EM-like, alternating the estimation of covariate effects and the factors. Because the estimation of covariate effects is severely affected by dependence, estimation takes advantage of a prior knowledge of timepoints in which no signal is exepected to better separate the covariate effect and the noise.